SAN JOSE, Calif. — They may top the list of the country’s “best companies to work for,” but the thousands of nonunion contract workers who serve gourmet lunches in the luxury cafeterias of Silicon Valley high-tech firms don’t see it that way. 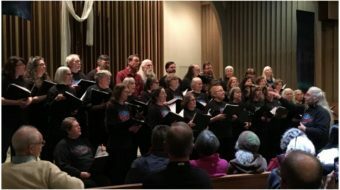 The Unite Here union brought food service workers together with labor, elected officials, and community and faith leaders at Antioch Baptist Church Jan. 29 to launch a campaign for a corporate code of conduct. With the code of conduct, area high-tech firms would commit to contract with service companies that provide fair wages and adequate health benefits, comply with state and federal laws, and take a neutral stance toward union organizing. The event focused on companies contracting for food service with Guckenheimer Enterprises, which serves dozens of firms such as Genentech, Oracle, Applied Materials and Broadcom. Workers told harrowing stories about their experiences on and off the job. They and other workers emphasized the importance of standing together for union recognition. 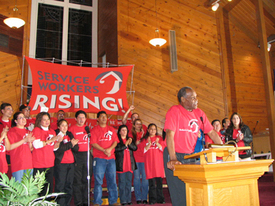 The rafters rang in San Jose’s oldest African American church as South Bay Labor Council head Phaedra Ellis-Lamkins, legendary United Farm Workers union co-founder Dolores Huerta and actor/director Danny Glover led the standing-room-only crowd in chants of “Sí, se puede” and pledges of support for the workers’ campaign. 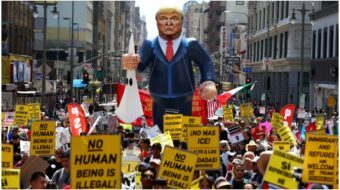 “It is significant when we, men and women of color, come together to celebrate and honor each other, and to respect each other’s right to work and to organize,” Glover told the crowd. Without the food service workers “putting food in their stomachs,” the high-tech workers “wouldn’t be able to do anything,” Huerta reminded the audience as she urged them to sign cards affirming their support. “We are going to try to reach the employers’ hearts, their consciences, and to let them know we are not going to let them keep these workers in a state of poverty,” she declared.